ancillary substances: magnesium stearate, ludipress (lactose, povidone, crospovidone). White or nearly white, round tablets, top and bottom flat, the side surface with edges rounded. Metenolone is a steroid anabolic. By penetrating into the cell nucleus, it stimulates the cell's genetic machinery, which leads to increased synthesis of DNA, RNA and structural proteins, activates tissue-type enzymes and increased tissue respiration, oxidative phosphorylation, ATP synthesis and intracellular macrocellular accumulation . 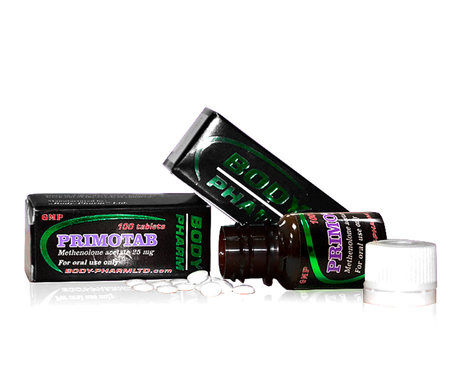 It stimulates the anabolic processes and inhibits the catabolic ones caused by glucocorticoids. Increases muscle mass, reduces fat deposition, improves trophic tissue, favors calcium deposition in bones, retains sodium and water in the body. Hematopoietic action is determined by increased erythropoietin synthesis. Androgenic action (moderate) may contribute to the development of male secondary sexual characteristics type. Disruptions in protein synthesis, cachexia of various genesis; Trauma, burns, after infectious diseases and irradiation; Muscular dystrophy, osteoporosis, negative nitrate balance in corticosteroid therapy, hypo- and aplastic anemia. Primobol administered to adults at a dose of 2-3 mg / kg. Duration of treatment is 3 months and can be extended based on results. In women - symptoms of virilization, menstrual cycle disorders. In males: in the prepubertal period - symptoms of virilization, retention or cessation of growth (calcification of epiphyseal growth zones of tubular bones); In the post-puberty period - gynecomastia, priapism, inhibition of spermatogenesis. In men and women - progress of atherosclerosis, peripheral edema, liver dysfunction, changes in leucocyte pattern, pain in long tubular bones. Hypersensitivity to the preparation, prostate cancer, breast cancer in men, mammary carcinoma in women with hypercalcemia, severe atherosclerosis, nephrotic syndrome, acute and chronic liver disease including alcohol, nephritis, pregnancy, lactation period. When the first signs of virilization of the patients (voice thickening, hirsutism, acne, clitoromalgia) occur, administration should be stopped to avoid irreversible changes. Systematically control lipidemia and cholesterol. Store in a dry place and away from light at 15-25 ° C.